ESPN did something interesting for the National League Wild Card game Tuesday night, delivering an alternate stats-focused “Statcast” broadcast on ESPN2 with Jason Benetti, Mike Petriello (the MLB.com Statcast guru who’s been a regular on MLB Network’s yearly Statcast broadcasts), and Eduardo Perez. That broadcast drew plenty of praise on social media, especially compared to the criticism for the main ESPN booth of Matt Vasgersian, Alex Rodriguez, and Jessica Mendoza. An unscientific poll we ran on the Awful Announcing Twitter account saw 65 percent saying they preferred the Statcast broadcast (of over 2,800 votes as per 2 a.m. Eastern Wednesday morning), and there was plenty of glowing commentary about it elsewhere too. • Focused on what's fascinating about the game rather than obsessing on what's wrong. This Statcast espn2 broadcast is the broadcast we've wanted, needed, and deserved. Thanks to @mike_petriello and crew! The Statcast broadcast is extremely enjoyable and it's not only because of the numbers aspect. The broadcasters are really, really engaging and knows how to integrate the nerdier aspect of baseball into what they see directly in action. Good stuff @mike_petriello. It’s laughable how much better the Statcast broadcast (ESPN 2) of this NLWCG is compared to the main ESPN broadcast. Why is this the “special edition” again? After just five minutes of watching this StatCast broadcast, I’m ready to say it’s leagues above ESPN’s regular broadcast. One of the reasons I think this @statcast broadcast works is you have the ideal combo of stat researcher/writer & former player. TREMENDOUSLY enjoyed the Statcast broadcast. Just absolutely loved it. Forgot it was a "special" thing; just seemed natural. Very natural flow of information, not forced into the game at all. Very professional. Loved it. This StatCast on ESPN2 is outstanding. Baseball's the perfect forum for a geeked-out broadcast: so many next level stats and so much down time to kill. Enjoying the ESPN2 StatCast telecast of the NL Wild Card Game. Can forego Matt Vasgersian and Alex Rodriguez for Jason Benetti, Eduardo Perez and Mike Petriello. From this corner, Benetti, Petriello, and Perez delivered an outstanding broadcast, and one that didn’t feel gimmicky. They’d bring up advanced statistics like weighted runs created plus when it made sense, but explained them and didn’t shoehorn them in. They smartly used on-screen graphics (such as the probabilities of hitters hitting to different parts of the field, or the length of a lead a runner was taking) in a way that wasn’t overly distracting (namely, before pitches were thrown). The chemistry between the three was great, with Benetti getting the most out of both of his boothmates and Petriello and Perez agreeing sometimes and disagreeing at other times, but always providing interesting insights and being respectful of the other’s perspective. And this broadcast really didn’t advanced statistics being forced down your throat every second. The booth would discuss what the data showed when it made sense to do that, but it didn’t feel like much more than you hear a typical broadcast talking about more mainstream stats, such as batting average or RBI. But another element that boosted this was addition by subtraction; there were a lot less cliches than you hear on many baseball broadcasts, and there was a whole lot less of crusty complaining about particular behavior from players. For example, the Statcast broadcast discussed Javier Baez’s 11th-inning hug on the basepaths as not a big deal, a perspective supposedly-interfered-with player Nolan Arenado agreed with in an interview after the game. That was a remarkable contrast to the way Rodriguez went off on that on the main ESPN telecast, arguing “The rules are the rules.” That was a particularly funny reaction, especially considering that SportsCenter host Scott Van Pelt and ESPN MLB analyst Mark Teixeira agreed with the Statcast guys in their own post-game comments, not with Rodriguez. But the Statcast broadcast’s handling of this was mature and reasonable, while the main broadcast did not do so well. 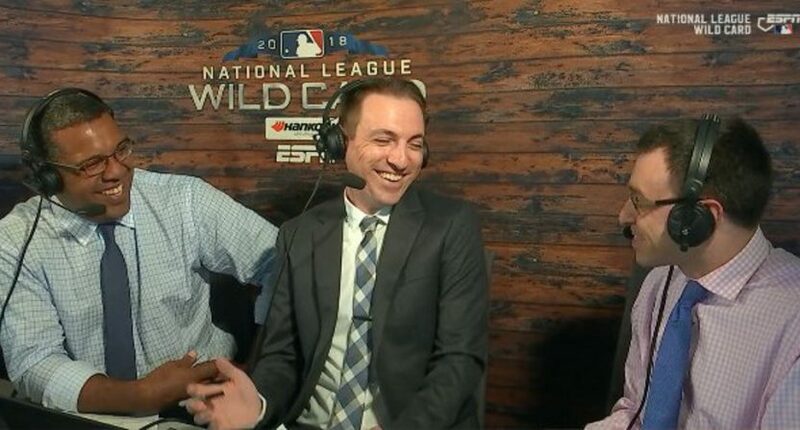 Update: This was reportedly less awkward on the ESPN broadcast, where Vasgersian said “I was enjoying that” afterwards. And that’s where Benetti’s “Good to hear that Matt is enjoying this” line comes from. But on ESPN2, the “Is that it?” seemed awkward. Alex Rodriguez has got to be the worst announcer in all of sports. Hey ESPN can you please mute Alex Rodriguez? I think a lot of people would appreciate that. So, yeah, some of the love for the Statcast-focused Wild Card game broadcast may have been in comparison to the alternative. But it was also very well done, and a refreshing look at what baseball broadcasting can be in 2018. On Tuesday night, it certainly seemed like the better option.